Image caption Rail passengers were told trains were delayed due to "strong sunlight"
Rail passengers were left angry after being told trains were delayed due to "strong sunlight". 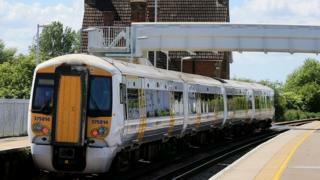 Services were disrupted because of the angle of the sun in Lewisham, south-east London, train operator Southeastern said. It apologised and tweeted: "We had severe congestion through Lewisham due to dispatching issues as a result of strong sunlight." Passengers also took to Twitter - to share their disbelief at the excuse. Paul Malyon described it as "the weakest excuse ever". Rob List wrote: "I can't have heard properly because if I did, I believe my train's been delayed due to SUNLIGHT?!?" Zuzanna Sojka tweeted: "Canon Street train delayed due to sunlight! @Se_Railway i admire your creativity!" A spokesman at Southeastern said: "We know that sometimes it seems that if it is not leaves on the line or snow on the track then it is some other weather issue. "But actually glare this morning made it impossible for some drivers to see the full length of their train in their mirrors before leaving stations. "When this happens they have to get out and check to ensure everybody has got on or off their train safely before they can move. "This can take a little more time but thankfully for all it doesn't happen very often." There have been additional problems following a landslip at Barnehurst on Monday evening. All services between Lewisham and Dartford via Bexleyheath were cancelled for the rest of the day as a result. There were also difficulties on the Southern network when a sinkhole caused trains between Redhill in Surrey and Tonbridge in Kent to be suspended.